Come join your friends at The Green Ceiling for the funnest way to spend a Sunday. We get started at 4:20 with a smokeout and an open music jam featuring the Spliff Personalities, so bring your instruments down and join in on the fun! 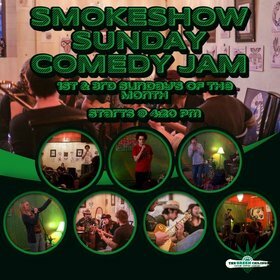 Then we've got an open mic comedy show starting at 6:00 so bring your best jokes and laugh away the evening! Music is open invite. Bring your instruments down and jam with the Spliffs.